The Medium-Sized Telescope (MST) will be built by an international collaboration of institutes and universities from Austria, Germany, France, Brazil, Poland, Spain, Switzerland and the Italy. This will be CTA’s “workhorse,” with sensitivity in the core energy range of CTA, from about 150 GeV to 5 TeV. The planned baseline for CTA includes 40 MSTs – 25 in the southern hemisphere and 15 in the northern hemisphere. 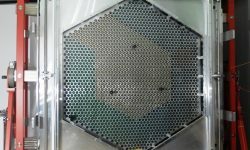 The MST mirror will be about 12 metres in diameter and will have two different camera designs that use photomultiplier tubes (PMTs). 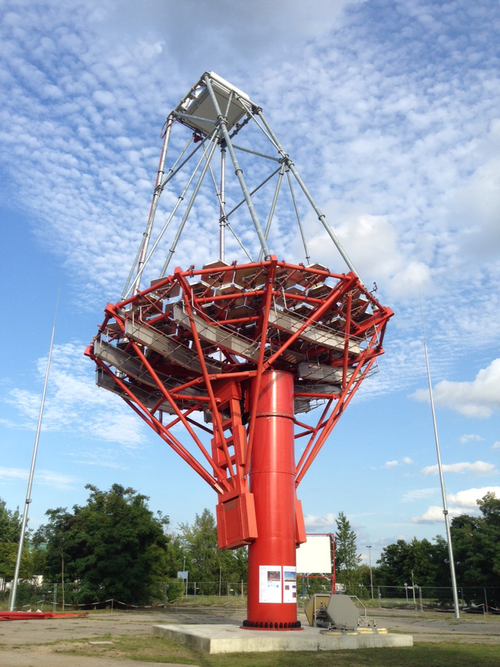 The MST cameras will have a large field of view of about 8 degrees, enabling the MSTs to take rapid surveys of the gamma-ray sky. 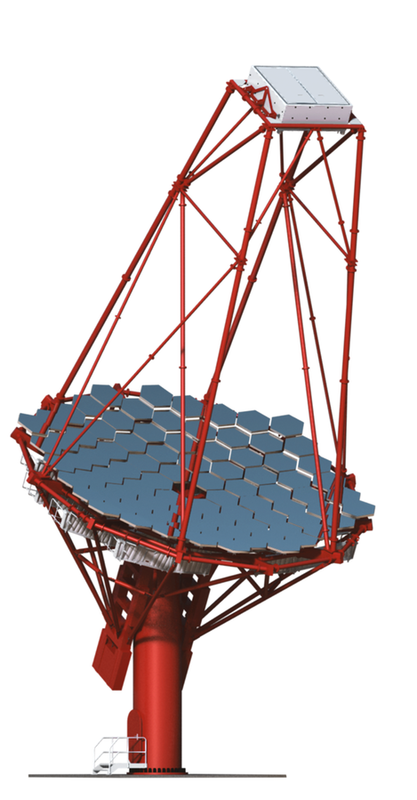 The MST is a modified Davies-Cotton telescope with a reflector diameter of 12 m on a polar mount, and a focal length of 16 m. The MST will have up to 90 hexagonal-shaped mirrors that are aligned with an active mirror control assembly to create a uniform reflector. 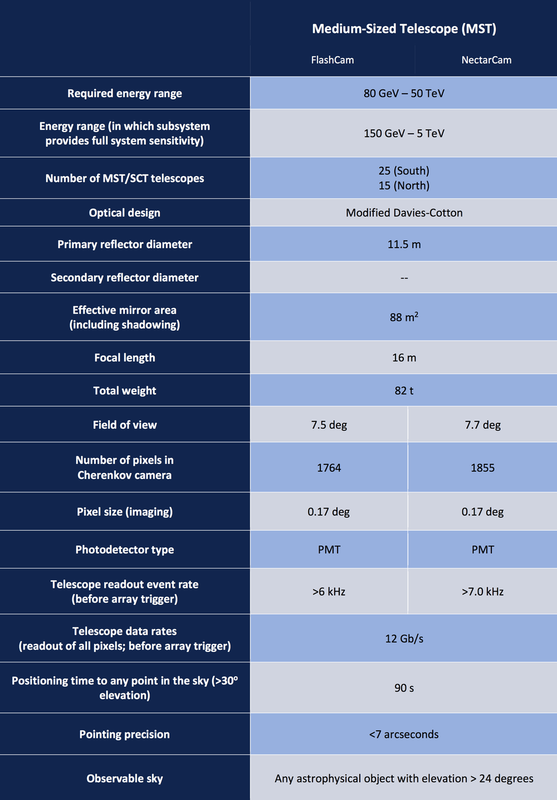 The key specifications are listed in the table below. NectarCAM uses the ‘Nectar’ analog pipeline ASIC for signal capture with GSample/s sampling rate and shares many design features/components with the LST camera. NectarCAM is composed of 265 individual and easily removable modules. Each module is composed of seven photo-detectors (photomultipliers) with their associated readout and local trigger electronics. Each photo-detector is associated with an individual high voltage and preamplifier board. The high voltage of the photomultipliers is controlled remotely. FlashCAM design follows a horizontal architecture with the photon detector plane (PDP), the readout electronics (ROS) and the data acquisition system (DAQ) as key building blocks. The PDP contains photomultiplier tubes (PMTs) arranged in a hexagonal structure. 12 PMTs are combined in a PDP module, which provides high voltage and contains pre-amplifiers, as well as a micro controller for slow control, monitoring and safety functions. The signals are then transmitted via cables to the readout electronics, the design of which is based on a fully digital approach with continuous signal digitization. 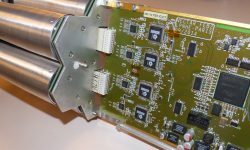 The signals are digitized continuously with 12-bit FADCs with a sampling frequency of 250 MS/s. The readout system is unique with its fully digital approach and the custom-developed high performance Ethernet transmission from the front-end into the camera server. 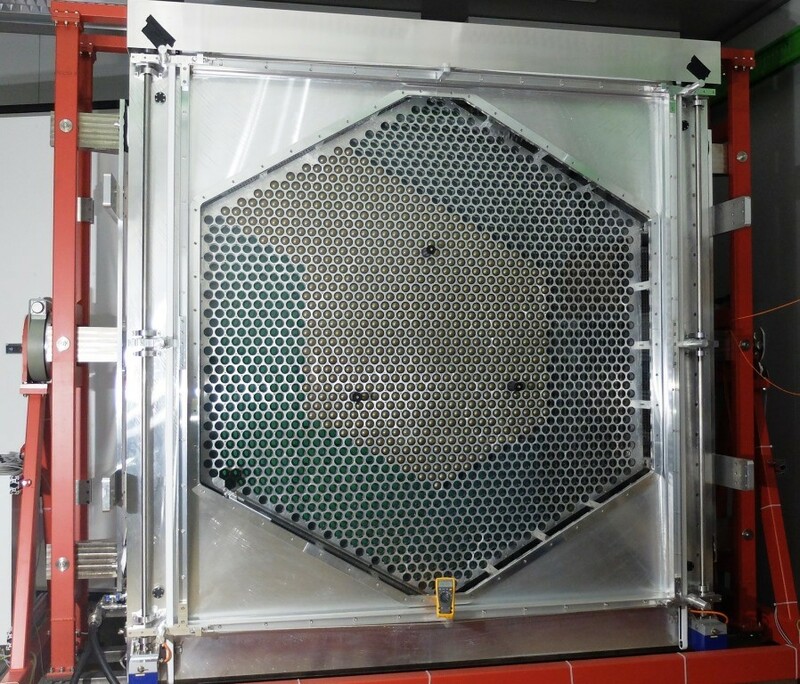 An MST prototype was deployed in Berlin in 2012 and is currently undergoing performance testing. The main purpose of the prototype is to validate the design of the individual components, test the interfaces between the mating assemblies and to define the assembly process of the product. The prototype has a fully functional drive system, cameras for pointing and tracking, sensors designed to record the behavior response of the structure and drive system and a weather station. It is a fully-functioning telescope, without a real telescope camera assembly and its readout. Camera demonstrators were built, tested and validated in parallel by the two camera sub-projects.